The NI Assembly’s Research and Information Service (RaISe) jointly delivers KESS (Knowledge Exchange Seminar Series) with the Queen’s University of Belfast, Ulster University and The Open University (OU – 2013). KESS is the first of its kind in the United Kingdom, formally partnering a legislative arm of government – the Assembly - with academia. 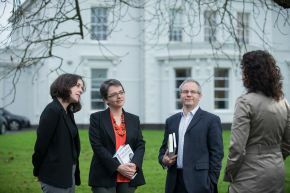 Aiming to promote evidence-led policy and law-making, KESS provides a forum in which academics present their research findings in a straightforward format, on issues that are relevant to governance in Northern Ireland. It seeks to bring those findings to the attention of key participants and decision-makers, including MLAs, the wider public sector and others, in a “safe space” that encourages discussion, fosters improved understanding and seeks to enable opportunities for more in-depth engagement in future.